The team from Uganda Martyrs University posing with their cash prize. Courtesy photo. Uganda Martyrs University Nkozi has emerged winner of the 2017 Students’ Design Competition an annual competition organised by the Uganda Society of Architects (USA) to celebrate and exhibit talent of the young professionals studying architecture in institutions of learning recognised by the National Council for Higher Education (NCHE). Four Universities participated in this year’s competition including Kyambogo University which came second and International University of East Africa (IUEA) which took the third place. Makerere University also participated. 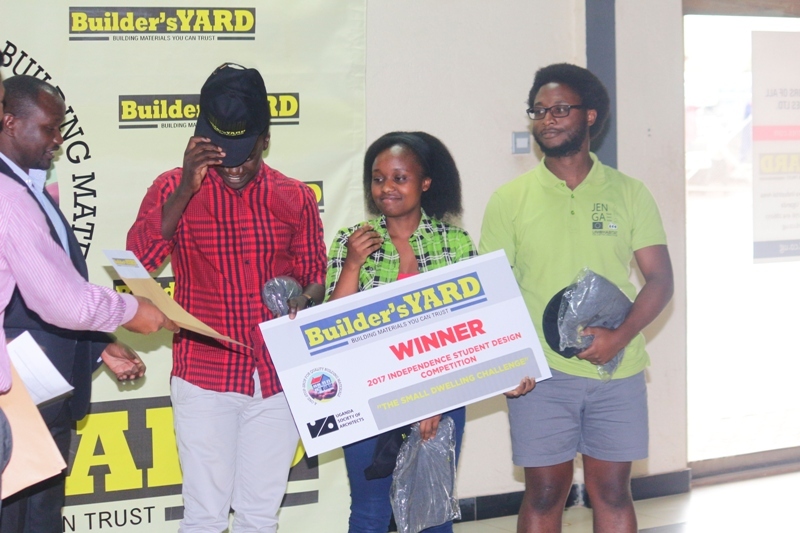 The event to award the winners was held at Builder’s Yard Limited who also sponsored the competition and awarded cash prizes of $3,500 with $2,000; $1,000 and $500 for first, second and third place respectively. The winning designs were carefully selected by a panel of three judges; Arch. Davy Mugamba (Principal Architect at Proplan), Arch. NalikkaKasenge (Techical Director at Obuntu) and Arch. Gloria Bazira (Managing Partner at Regenesys). Organized under the theme: “The Small Dwelling Challenge”,the competition challenged the students to come up with housing designs that promote quality and affordable housing in Uganda taking into account efficient use of space using metal prefabricated materials and sustainable environmental practices (green building practices). According to Builder’s Yard Business Corporate Affairs Manager, Anil Sankara, the winning design will be constructed using SMARTFRAME pre-fabricated materials from Builder’s Yard and showcased during this year’s Uganda manufacturers Association Trade Show. Students of Uganda Martyrs University posing with their winning design. Courtesy photo. “SMARTFRAME Pre-fabricated building materials are an easy and cost effective mode of construction where the parts are made in the factory and brought to the site for installation. The unit will be a practical example of quality and affordable small dwelling unit,” said Anil. 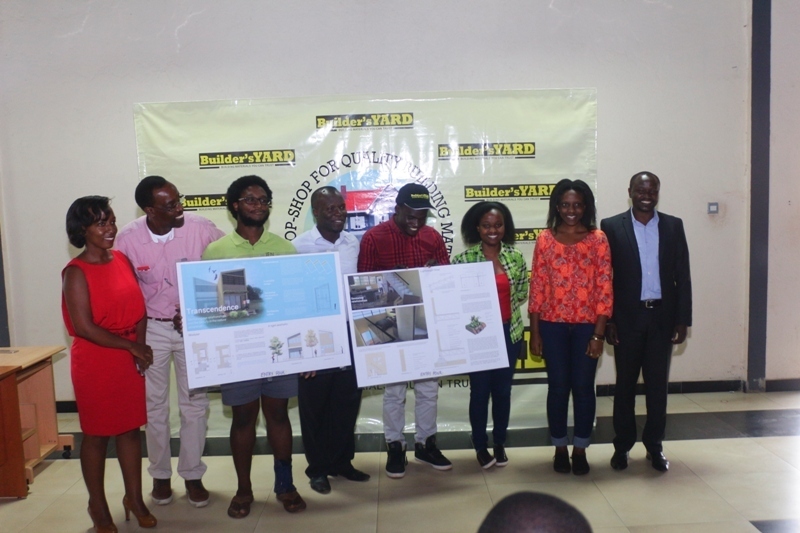 Builder?s Yard is a pioneer company in Uganda to introduce SMARTFRAME light gauge steel frames as an alternative, sustainable and affordable mode of housing for urban dwellers.